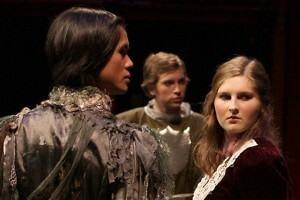 The Fall Festival of Shakespeare is a non-competitive region-wide collaboration between Portland Playhouse and area high schools. The Festival is a spectacular theatrical event, in part because student actors connect well to Shakespeare; they understand the passion, the large stakes, and the disaster. High school is not unlike an Elizabethan Tragedy. The students are not only performers in the festival, but a large and vocal component of the audience. They are most active and vibrant theatre patrons you will ever encounter. They “oooh” and “ahhh”; call out “Oh no she didn’t”; scream and laugh. It’s the closest thing we have to how an Elizabethan audience at Shakespeare’s Globe might have reacted. It’s an unforgettable experience for the students involved, and an engaging cultural phenomenon for everyone to witness.